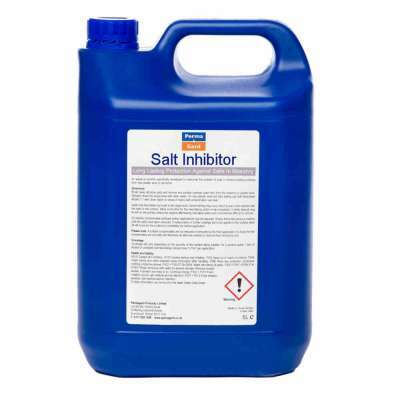 Ready-to-use salt inhibitor for use before rendering or tanking to treat destructive salts in masonry. PermaSEAL Salt Inhibitor is designed as a primer and salt inhibitor for wet-applied waterproof tanking and rendering systems. In particular, PermaSEAL Tanking and PermaSEAL Renovating Plaster. It comes ready-to-use and is highly effective at treating destructive damp-causing salts that absorb water from the air. In particular, the salt inhibitor targets the invisible chloride and nitrate hygroscopic salts. Another benefit of the salt inhibitor is that it allows the substrate to maintain its breathability. On crumbly masonry (friable), additional strength is provided through the deposit of silica gel. Do not use PermaSEAL salt inhibitor on any surface that will be left exposed. Make sure all surfaces are clean, and free of dust and residue. Any previous surface coatings should be fully removed. On dry surfaces, you should fully wet out the substrate with clean water – this will assist the coating. The surface should be damp but not wet, with any standing water removed. You should apply the salt inhibitor evenly using a course sprayer, masonry roller or brush. Coverage is at a rate of 0.2 – 0.25l /m2 in a single coat. Important Note - do not allow to dry. After Salt Inhibitor has been absorbed, but before the substrate has dried (this should be around 15 to 30 mins), apply a subsequent coat of tanking wet-on-wet or render over the entire area. Only apply enough Salt Inhibitor to an area that can be covered before it dries.